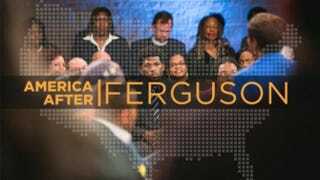 Marie Nelson produced the multiplatform "America After Ferguson," a PBS town hall meeting that aired in September and explored issues raised by the fatal police shooting of Michael Brown in Ferguson, Mo. Marie Nelson, a broadcast executive who was founding executive producer of NPR's "Tell Me More," worked at ABC-TV's "Nightline" and oversaw projects at Black Entertainment Television, was named vice president, news and public affairs Friday at PBS, the network of "PBS NewsHour," Ken Burns documentaries and the investigative series "Frontline." "In this role, Nelson will collaborate with executive producers of acclaimed PBS news and public affairs series, as well as independent producers, to develop and direct innovative approaches to engage audiences in current events across these programs and platforms," a PBS announcement said. Gwen Ifill, co-anchor and managing editor of "PBS NewsHour" and managing editor and host of "Washington Week," told Journal-isms by email, "I think it's a wonderful and inspired choice. Marie and I worked closely on one of the productions I'm proudest of — the September PBS Special 'America After Ferguson,' where we gathered a diverse town hall of St Louis area residents to talk about their worry and their pain — face to face. "I look forward to Marie now bringing her unique voice to an even broader spectrum of PBS programming." Nelson, who is African American, will become the rare person of color leading news efforts at a mainstream broadcast network. Paul S. Mason did not lead the news division at ABC News but was a senior vice president there, stepping down in 2009. Adam Powell was NPR's vice president for news and information from 1987 to 1990 and remains the only African American to have held that post. Mark Whitaker was a vice president at NBC and CNN. Antoine Sanfuentes was senior vice president of NBC News and chief deputy to then-NBC News President Steve Capus. And though his network did not produce news, Johnathan Rodgers was president of the Discovery Communications U.S. Networks group. Among women of color, Ingrid Ciprian-Matthews has been vice president of CBS News since 2011, reporting to CBS News President David Rhodes. Jennifer Lawson was executive vice president, programming and promotion services at PBS from 1989 to 1995. She was public television's first chief programming executive. Lyne Pitts was vice president, strategic initiatives at NBC News from 2007 to 2009. Nelson will report to Beth Hoppe, chief programming executive and general manager, general audience programming, who said in the news release, "Marie is a proven leader with experience in development and production for a diverse range of public affairs programs, documentaries and live specials. Her expertise producing our multi-platform initiative, AMERICA AFTER FERGUSON, demonstrates exactly why she is an outstanding choice to fulfill this role for PBS." PBS has more than 350 member stations and reaches nearly 109 million people each month through television and more than 28 million online. In 2007, Hispanic organizations criticized PBS and Burns for inadequately representing the contributions of Latinos in his 15-hour documentary on World War II. Last year, however the network aired "Latino Americans," a three-part, six-hour documentary on the 500-year history of Latinos in America. It is currently running the eight-part "America by the Numbers," a series on the demographic change that will see the nation become majority people of color in 2043; and the 10-episode second season of "Finding Your Roots with Henry Louis Gates, Jr. (video)"
The news release also said, "Nelson is a seasoned content developer with experience in public media and other broadcast and cable organizations. Most recently, she served as executive producer of national programs at PBS member station WGBH. At WGBH, she oversaw the production of AMERICA BY THE NUMBERS . . . Prior to WGBH, Nelson was the acting vice president of news & original programming for BET Networks, where she oversaw a range of cross-platform projects, including Battleground 2012, a yearlong politics initiative. "She also served as the founding executive producer for NPR's 'Tell Me More' and as a producer for 'Nightline' with Ted Koppel and 'World News Tonight' at ABC News. Nelson has also served in public affairs and international development roles with the U.S. Department of State, the Rainbow/PUSH Coalition and Africare.
" 'PBS is among the top destinations for news and public affairs programming and I'm thrilled to help lead these efforts for PBS and its member stations,' said Nelson. 'I look forward to working with all of PBS’ award-winning news and public affairs producers to bring important and informative stories to engage audiences in exciting ways.' "
"Today from the file of stories that would be simply ridiculous if they didn't reveal sad realities of life in America: during a get out the vote drive, Minneapolis mayor Betsy Hodges posed for a photo with a black constituent, only to be slammed by local police as 'throwing up gang signs,' " Kia Makarechi wrote Friday for Vanity Fair.
" 'Is this something that could incite gang violence in the city?' the head of a police union asked the ABC affiliate who covered the story. He posed his question with a straight face. Paraphrasing a retired cop, the broadcaster for the segment added, 'the photo creates a safety problem for every gang unit in the metro [video]'. "The man in question is Navell Gordon, whom the Daily Kos identified as a volunteer for Neighborhoods Organizing for Change. Another video shows Gordon and Hodges awkwardly trying to figure out how to pose for a photo. And another photo from the scene reveals that Minneapolis police chief Janeé Harteau was actually present as well. Harteau declined to comment for the local news broadcast's hysteria-driven segment. "Hodges had previously criticized the police force, and told residents that she was aware that 'some officers abuse the trust that is afforded to them, and take advantage of their roles to do harm rather than prevent it.' It appears as though some officers have found a way to strike back with an assist from KTSP, the ABC affiliate.
" 'It's a story you'll see only on [channel] 5,' the station's anchor said while introducing the segment. That's hardly a compliment." It did not take long for the discussion to turn to the racial implications of the episode. "Sadly, only racism allows such an ugly story and stereotype to be advanced about a young man who was clearly not flashing a gang sign with the mayor of Minneapolis," Shaun King wrote for the Daily Kos. "He deserves a public apology and heads should roll at this station for even allowing it to ever make it to the air. . . ."
Law professor Nekima Levy-Pounds wrote in a Minneapolis Star Tribune opinion piece, "After processing the contents of the story, I thought about the tens of thousands of white Minnesotans who tuned into the news and were served a steady diet of racial stereotypes, innuendoes, and a false narrative about the Mayor and the young African American man standing beside her in the photo. For white Minnesotans who do not personally know any young African American men, it is all too easy to take the media's word as absolute truth and embrace the negative racial stereotypes that are being perpetuated about the young man in the photo." Duchesne Paul Drew, managing editor for operations, newsroom at the Star Tribune and president of the Twin Cities Black Journalists, told Journal-isms by email, "I think KSTP's report makes them look silly, which is too bad because gangs are a real problem in our community and in communities across the country. In a way, this trivializes a very serious issue. To suggest that the mayor knowingly flashed a gang sign by pointing at someone in a posed photograph at a community event is ridiculous. There's probably a gang out there somewhere whose members give each other the 'thumbs up' sign. Is that off limits now, too? Is the mayor going to have to stop wearing red?" KTSP reporter Jay Kolls defended the story on his Twitter account late Thursday night, replying directly to 34 people, Bob Collins, Molly Bloom and Meg Martin reported for Minnesota Public Radio. MPR suggested that the story reflected a lack of management diversity at KSTP. "The story is missing the context in which the photograph was taken (Hodges and Harteau had spent the day on a get-out-the-vote effort with the Neighborhoods Organizing for Change group); it implies that the man in the photo, Navell Gordon, is a gang member (though later in the story, it says there's no evidence Gordon was part of a gang); and the fact that it worked its way through the TV station's editing process indicates that the newsroom lacked the kind of voice along the way that might say, 'Wait a minute.' . . ."
Joseph Lindberg, Pioneer Press, St. Paul, Minn.: Minneapolis' #Pointergate: Next stop, 'The Daily Show'? "Democrats maintained a large edge among Latinos voting in Tuesday's midterm elections, but in some states, Republican candidates won more than 40% of the Latino vote, according to a Pew Research Center analysis of National Election Pool exit poll data as reported by NBC News," Jens Manuel Krogstad and Mark Hugo Lopez reported Friday for the Pew Research Center. "Though Democrats comfortably won the Latino vote in nearly all states that had key Senate or gubernatorial races (and for which exit poll data is available), Republican candidates won many of those contests, and will take control of the U.S. Senate for the first time since 2007. "In congressional races nationally, Democrats won the Latino vote by a margin of 62% to 36%. This is comparable to the last midterm cycle four years ago when six-in-ten (60%) Latinos voted for a Democratic candidate, but down from 2012 when Democrats took 68% of the Latino vote. "By comparison, Republicans won the white vote by a nearly as wide a margin — 60% to 38%, essentially unchanged from 2010 and 2012. Among black voters, 89% voted for the Democratic candidate in their local congressional election while 10% supported the Republican. This is unchanged from 2010. In 2012, 91% of black voters supported Democrats and 8% backed Republicans. . . ."
"As he's enjoyed mentioning in the past, Sharpton has a direct line to the White House. He's visited numerous times, trades daily emails with Ms. Jarrett. So when the Democrats went down in flames three days ago, guess who President Obama met with the next day? Not Mitch McConnell, not John Boehner, not DNC Chairwoman (for now) Debbie Wasserman Schultz. Instead, it . . . was MSNBC's ratings-challenged 6:00 p.m. host (along with other civil rights leaders), a White House official had confirmed. On the docket — because Sharpton is obviously an expert in all of these things — was Obamacare implementation, education and criminal justice. . . ."
Michael H. Cottman, BlackAmericaWeb.com: Does President Obama Need An Olive Branch Or A Switch After Midterm Defeats? Charles D. Ellison, The Root: How Will This Shocker of an Election Shake Things Up on the Road to 2016? Its release also said, "Tan joins Seventeen from People, where she most recently served as special projects editor. Tan begins her new role in December, and will report to Joanna Coles who added responsibility as editorial director of Seventeen in September, in addition to her existing role as editor in chief of Cosmopolitan. . . ."
The release later added, "Tan joined People in 2002 as an editorial assistant, later rising to staff writer from 2004 to 2009, covering human interest and entertainment stories, celebrity cover stories and awards season in Los Angeles. After rising to senior editor in 2011, Tan was named special projects editor in 2014 where she was responsible for overseeing, packaging and editing special double issues for the weekly magazine, subscriber specials and newsstand issues, including Half Their Size, Hollywood’s Most Talked About Bodies, Hollywood’s Hottest Bachelors and World’s Most Beautiful People. . . ."
"ESPN will tackle the issue of domestic violence in sports in a Nov. 11 one-hour special, the network said Friday," R. Thomas Umstead reported Friday for Multichannel News. "The Outside The Lines Special — 'Domestic Violence and Sports: Out of the Shadows,' special, hosted by veteran sports journalist Bob Ley, will continue the network's extensive reporting on the subject of domestic violence, said network officials. Panelists for the special include espnW's Jane McManus; NFL executive Vice President of football operations Troy Vincent; and Shawnda Wilkinson, ex-wife of 'Big Daddy' Wilkinson. . . . "
Dana Jacobson, MSNBC: Does NFL's culture of violence begin at the college level?
" 'A forgotten crisis.' That's how the Council on Foreign Relations defines the state of affairs in the Central African Republic — a landlocked stretch of scrubland and dry forest wedged between Chad and the Democratic Republic of Congo," Jake Flanagin wrote Wednesday for the New York Times. The State Department lists Syria, South Sudan, the Central African Republic and West Africa's Ebola epidemic as the world's worst humanitarian crises. "Despite a refugee crisis to rival Syria's, 'the international community hasn't done nearly enough to alleviate suffering in C.A.R.,' she says. 'In 2013, C.A.R. was the fifth most underfunded U.N. appeal and appeared in Echo's 'Forgotten Crisis Assessment' in both 2012 and 2013.
" 'Not only has the international community failed C.A.R., the media's scant coverage of the crisis means that the average Westerner is wholly unaware of what's happening in the country. Unlike for Gaza, there have been no marches or protests in support of humanitarian aid for the civilians in the Central African Republic,' she explains. "This needs to change, she says. Echoes of Darfur and Rwanda are loud, clear and present, and as 'President Obama's foray into Iraq has been billed as a humanitarian intervention,' there is no logical reason to ignore the strife . . ."
Meanwhile, Lauren Wolfe, writing for Foreign Policy, examined the false hopes raised by media reports last month that the schoolgirls kidnapped from Chibok, Nigeria, by the Boko Haram, the militant Islamic group, would be released. "What was missed, in all the fervor of the story of the missing girls, was a chance to take on a murkier, more challenging story — which the Chibok tragedy has been from the beginning, Wolfe wrote. " 'Much as we might wish this to be a single issue with a clear solution, it isn't, and it cannot be. It never was,' Nigerian-American writer Teju Cole tweeted about the schoolgirls back on May 8. The previous day, his frustration at naive Western views on how to fix Nigeria was barely veiled: 'For four years, Nigerians have tried to understand these homicidal monsters. Your new interest (thanks) simplifies nothing, solves nothing.' . . ."
At last weekend's Journalism & Women Symposium (JAWS), Jill Abramson, former executive editor of the New York Times, defended Times television critic Alessandra Stanley, who ignited a furor in September when she labeled television producer Shonda Rhimes an "angry black woman." Asked about racial diversity, Abramson said she chose Dean Baquet, who is African American and now executive editor, as her managing editor. She also said retention was a problem, citing Lynette Clemetson, who left the Times in 2007 to become founding managing editor of The Root. Those comments did not sit well with Tracie Powell, who asked Friday in a headline on her alldigitocracy.org, "Is Jill Abramson right about it being harder to retain women journalists of color than to recruit them?" Powell wrote, "Abramson's comments at the JAWS Conference fail to paint a complete picture of what's happening in U.S. newsrooms when it comes to women of color. What she didn't say is that women of color are losing ground in the news media. It's not that we choose to leave, oftentimes we can't even get a foot in the door." Powell went on to quote Dori J. Maynard, president of the Maynard Institute for Journalism Education. "And if we do, as Maynard said, we're often made to feel as if our voices aren't valued and our stories aren't stories. Abramson proved that, once again, at the JAWS conference when she defended Alessandra Stanley. . . ."
Powell also wrote, "For those who remain in newsrooms, race and gender help shape their perspectives. That's just fact, and it should be valued. And if corporate newsrooms don't allow us to bring these perspectives to the table, then there is very little incentive to stay. But these women have to be there in the first place in order for such a decision to be made; and there can't just be one of them. Even if a Lynette Clemetson leaves, the bench of women journalists of color at news organizations ought to be deep enough so that if one woman leaves, there are still several others left in the room. . . . "
Reginald W. Ragland, a former journalist and middle school language arts teacher and a lifetime member of the Journalism Education Association, said he has filed an internal, 85-point professional misconduct and discrimination grievance against a key planner of the national high school journalism convention that opened Thursday in the nation's capital. Ragland said he filed the grievance against Carol Lange, a retired Fairfax County, Va., yearbook teacher who is director of the District of Columbia chapter. She has "marginalized and insulted most D.C. media teachers," who are part of "the organization’s most ethnically-diverse jurisdiction of journalism and media teachers," Ragland wrote. Mark Newton, president of the association, said by telephone that he had not received the complaint and could not comment. Lange could not be reached. "The Committee to Protect Journalists wants President Obama to advocate for more press freedom when he visits Burma next week. He is traveling to Asia for the G20 Summit," John Eggerton reported Friday for Broadcasting & Cable. "In a letter to the President dated Friday, CPJ executive director Joel Simon said Burma had backtracked after releasing jailed journalists in 2012 following the U.S. decision to suspend sanctions on the country. . . ."
"Media outlets are slashing diversity; we are fighting back," says Farai Chideya, a journalist and professor. She is crowdfunding "One with Farai," a podcast that has "included guests who were black, white, biracial, East Asian, South Asian, Native American; gay and straight; U.S. born, immigrant, and non-American. This is our world right now, and definitely our future. We deserve to see ourselves fully represented. We shouldn't have to settle for media that is dumbed-down and doesn't show our true, fantabulous, colors. . . ."
"Al Roker is going to attempt to break a Guinness World Record," Catherine Taibi reported Thursday for the Huffington Post. Taibi also wrote, "The 'Today' show weatherman will try to break the record for longest uninterrupted live weather report broadcast. The current record stands at 24 hours. Roker wants to do it for 34 hours. . . . 'Rokerthon,' as NBC News is calling it, will begin Wednesday, Nov. 12, at 10:00 p.m. ET, and end Friday, Nov. 14, at 8:00 a.m. ET. . . ."
"An Associated Press photographer in Cuba, Franklin Reyes Marrero, has died in a car accident while returning from an assignment west of Havana," the Associated Press reported on Tuesday. "Reyes, 39, was driving from the port of Mariel on Monday after working on a story about the Cuban economy. He apparently hit a patch of gravel and lost control of his car, which crossed into oncoming traffic and collided with another vehicle, police and medical officials said. They said he died at the scene. The two occupants of the other car died later. . . ."
"Artie Lange, the comedian who for years played braying second fiddle to Howard Stern on The Howard Stern Show, has been banned from ESPN as a result of him tweeting racist and sexist jokes about the moderator of First Take, Cari Champion," Madeleine Davies wrote Thursday for jezebel.com. "As mentioned in yesterday evening's Dirt Bag, Lange issued an non-apology after going on a long and despicable Twitter ramble detailing a sexual fantasy in which he was Thomas Jefferson and Champion, a black woman, was his slave. "The National Association of Black Journalists was among those condemning Lange's remarks.